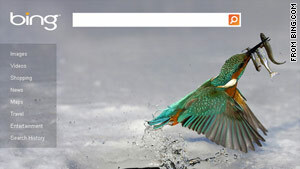 The author says Google copied Bing's homepage look and then reverted back to its standard white background. (Business Insider) -- Google is one of the smartest, most innovative companies in the world, but in its core business -- online search -- it's being routinely shown up by Microsoft's third-place search engine, Bing. The opinions expressed in this commentary are solely those of Jay Yarow.